Abstract: A cross-sectional study was conducted with the main objective to assess a psychological model for adherence in 82 HIV+ people, whom answered two self-administered questionnaires: a) adherence behaviors and psychological variables, and b) stress-related situations. The final structural model showed a strong influence of two stress-related situations (decision-making and tolerance to frustration) on motives to behave, which in turn had a relevant effect on behavioral competencies and adherence behaviors as well. This study confirms the theoretical and empirical potency of our psychological model for understanding and predicting why HIV+ people are practicing or not adherence behaviors, both consistently and efficiently. These results should be taken into account for designing intervention programs in the context of health care institutions in Mexico. Keywords: psychological model; adherence; HIV; antiviral therapy; intervention programs. Abstract: In two experiments with rats, we tested the positive and negative motivational effects of ethanol using the taste avoidance and place conditioning procedures. In Experiment 1, rats received, on alternate days, pairings of a flavour with 1.0 g/kg ethanol (i.p.) and pairings of a different flavour with saline. During testing, the subjects showed a lower consumption of the ethanol-paired flavour. In Experiment 2, rats were tested for the rewarding effects of ethanol using the place preference procedure. They received injections of ethanol before being placed in a distinctive environment for 30 min. When later given a choice between this location and a novel environment, the rats showed a preference for the environment in which they experienced the drug effects relative to control subjects injected with saline. These results show that alcohol appeared to have both aversive and rewarding effects given that the same dose of drug was able to condition an aversion for a paired flavour but a preference for a paired spatial location. Keywords: ethanol; conditioning; taste aversion; place preference; rats. Abstract: The aim of the present study is to assess the scientific productivity in the area of forensic psychology in Spain. A total of 350 articles were gathered through a bibliographic search conducted in the main indexed databases, as well as in other specialized publications. Results showed a growing profile regarding productivity in this area. Author’s productivity fitted Lotka’s law and collaboration analysis showed that most of the documents included in this study are one-authored articles. However, co-authored articles signed by small groups of authors were also typical in this area. The analysis of journal’s productivity showed the existence of a small group of very productive journals: Anuario de Psicología Jurídica and Psicopatología Clínical Legal y Forense. The present study describes, by means of the main bibliometric indicators, the scientific productivity in the area of forensic psychology, from its beginnings in Spain up to the present moment. Keywords: forensic psychology; scientific productivity; Lotka’s law; Spain; bibliometric study. Abstract: Schizotypy, also known as psychosis proneness, is a variable that is closely related to schizophrenia. Its interest and study basically resides in its capacity to detect individuals with profiles of risk or vulnerability for psychosis and in the possibility of early detection and prompt intervention through prophylactic treatments. The early identification of these types of at-risk individuals requires us to have adequate measurement instruments that allow us to make solid, well-founded decisions based on their score profiles. To date, there is no measurement instrument specifically designed for the assessment of this construct in Spanish-speaking adolescent populations. 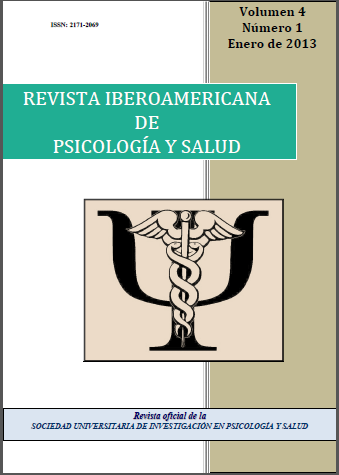 The main objective of the present investigation was to analyze the process of construction and validation of a new self-report named ESQUIZO-Q: Cuestionario Oviedo para la Evaluación de la Esquizotipia (The Oviedo Schizotypy Assessment Questionnaire). The results show that the ESQUIZO-Q is a brief and simple measurement instrument with adequate psychometric properties for the assessment of schizotypy that can be used as an epidemiological tool and a psychopathological screening method in the general adolescent population. Future studies should continue to explore the metric quality of the ESQUIZO-Q (e.g., sensitivity and specificity) as well as its relationship with endophenotypes in other types of samples. Keywords: schizotypy; psychosis proneness; self-report; adolescents; risk; schizotypal; schizophrenia. Abstract: With the aim of assessing an intervention program with teachers driven to promote the motivation skills in classroom, a field study was designed to measure the change, pre- and post-intervention, in the students in motivation, classroom environment and learning strategies. For this, 264 students of 1st year of Compulsory Secondary Education (CSE) and 253 of 3rd year, endorsed the CEAM (guest learning strategies and motivation), the CES (guest social climate in the class), and ACRA subscales of acquisition, coding, recovery and support. Results showed that the intervention program applied to teachers carried out to an improvement, among the students, in extrinsic goal orientation, self-belief and self-efficacy on performance. In relation to the classroom environment, the program enhanced it in the 3rd of the CSE. As for the strategies, coding was developed in both courses, while acquisition in 1st of CSE and attentional in 3rd. Finally, results support that the program was more effective intro females than males, and in 3rd year CSE students. Keywords: motivation; classroom environment; learning strategies; teachers; Intervention Program. Abstract: Academic failure and school coexistence are two of the main challenges of international education. The main aim of this work is to study the relationship between school failure and violence in Secondary Education. To achieve this objective, we applied the School Violence Questionnaire (“Cuestionario de Violencia Escolar” - CUVE) to a sample of 1742 students from seven Secondary Schools of Asturias (Spain). The results show that students who have ever repeated course perceive higher levels of violence at their schools than those who have never repeated, for all evaluated dependent variables (Teachers to students violence, Indirect physical violence by students, Direct physical violence among students, Verbal violence among students, Verbal violence of students to teachers and School violence). The most habitual kind of violence is verbal violence by students. These results are compared with previous works. Some educational implications are discussed. Keywords: school failure; academic achievement; school violence; bullying; secondary education. Copyright © SUIPS 2013. All Rights Reserved.